Foo Fighters and then a quieter weekend! So on Friday night we were off to London to see The Foo Fighters- Andy had got me tickets for my birthday. Before that I had one of the most stressful journeys driving home- mainly traffic at a standstill everywhere I turned, and then a dramatic bit: I got overtaken by a car driving at a mental speed along a narrow country lane, and then a split second later three police 4×4’s went passed with their sirens on (I just thought they were pulling the car over for dangerous driving)- the car didn’t pull over and they zoomed off into the distance, closely followed by three more police cars, and then one more. There was a helicopter circling overhead, and when I arrived in the village there were cars all over the road and the route I needed was closed (I think some cars had crashed- one had a wing mirror missing) so I took yet another diversion, and then got stuck in some roadworks (turned out it was armed police chasing a car all the way from Luton). My journey which is 35 mins on a good day and 45 mins on a bad day was around 85 mins- argh! Andy had been in London for 3 days so as soon as I got home I had to get back in the car and pick him up from the station- his trains had been bad that day too, and the way we were going to go was out of bounds as there were no trains running any more, so we had to leave asap, drive to Cheshunt and get the overground in. We made it to the stadium (the Olympic park) with 10 mins to spare! What can I say? They were awesome! 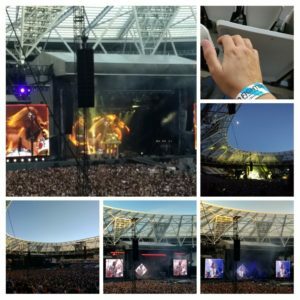 It was a totally rocking night, Dave Grohl was on top form, leaping about the stage, running up the catwalk style thing into the crowd, screaming into the mic. At one point the drumkit was raised on vertical pedestals, and Taylor Hawkins did the most immense drum solo (when we last saw them at Brixton Academy, they had two drum kits and did a sort of drum-off battle). To showcase each band member they played little sections of songs, even singing some of Grease Lightning to showcase the bass- something I never thought I’d see. Taylor Hawkins did a mean Freddie Mercury impression (the call and response bit- see this video for what I mean) (he was wearing the same swim trunks on Friday!) and then the two of them swapped places and sang Under Pressure (my fave Queen song), with Taylor Hawkins doing the Freddie Mercury bit and Dave Grohl doing the David Bowie bit and the drumming. Totally amazing. There was lots of Dave Grohl playing the crowd, and lots of f-bombs. At one point I mentioned to Andy that this was the total opposite of our last gig (Gomez- they are super chilled out)- he said back to me “Whippin’ Picadilly Mother F**ers”- this was the style from the Foos! A proper stadium rock show anyway. It finished with fireworks as they played Everlong- just fantastic. When it finished we had 13 mins to get the next train (or a long wait for the next one) so we ran, dodging the crowds, getting on the train with 30 seconds to spare! A late night on Friday meant I was glad of a local parkrun on Saturday morning. Dad was off out later in the morning so we met at Heartwood Forest- he can cycle there from home. I left it a little late (also, saw the fox cub in my garden at 8.30 right before I left) and could not find parking right away, so only just made the meeting place with 5 mins to spare, but as the actual start is a little walk from the meeting place and finish area, they usually begin a little late so I was fine. 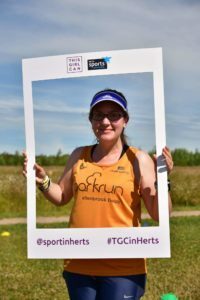 Herts were celebrating This Girl Can by having women as RD’s for all the parkruns that day, and they asked all the girls to step forwards at the start for a photo. Most men didn’t mind, but there were one or two who did not want to give up their starting position (even though everyone moved back after the photo…). Heartwood Forest is nearly two laps- you start half way up a hill, run to the top for gorgeous views of the countryside, down to the finish area, and then do a complete lap (with the hill being longer)- I ran with Dad for the first lap but he mentioned to me that he wanted to push the pace for the second lap as he hadn’t done much exercise this week, and that was fine with me as I was tired. It’s amazing how fast he ends up going- he finished in 25:36 and I came in at 28:56, so he was way ahead in the end considering we ran the first 3k ish together. I did walk on the long hill for a bit and used the time to take a few photos (the ones above). After I finished the RD was trying to hold up the big This Girl Can frame and take photos through it, so I offered to hold it for her, and then as it was still wobbly Dad held the other side. She managed to get a few snaps of runners coming towards the finish line. They then asked to take a pic of me too- I felt all sweaty and hot but actually it looks OK (and bonus, I’ve kept my eyes open which is a Very Hard Thing for me in photos). 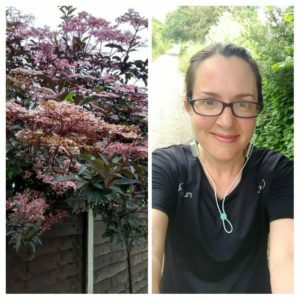 I mentioned the other day that I had been feeling unusually tired, and the lovely CT (check out her blog if you like to read about running with a dog combined with lots of amazing nature photos) commented that I could possibly have a virus. There have been a few going around at work, including slapped cheek, and when I actually looked at the symptoms, I think it could have been something like that, as I had a headache for several days (putting that down to be tired) and I have a rash on my arms but put it down to heat rash. Anyway, other than the late night on Friday, the weekend was a chilled affair. I watched a bit of TV while I had my breakfast, then pottered around a bit. 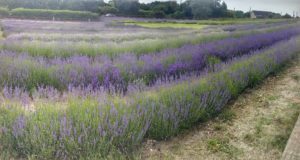 We then headed off to the Hitchin lavender farm- the main fields weren’t quite all purple yet, and we got there fairly late in the afternoon, so we just had a look at the display fields and then went to the cafe. 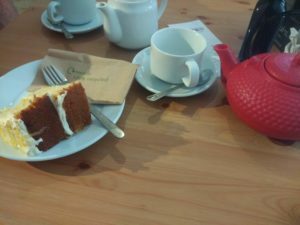 I had a lovely pot of rooibos tea with lavender and bergamot, and we shared some lemon cake. We were spoilt for choice over the cakes though- beetroot chocolate cake looked good, as did the honey and lavender cake. I bought a couple of little lavender plants to put in an empty pot, and so when we got home and it was cooler I did a little bit of weeding and planted out the lavender. On Sunday morning I had a slow and steady 10k run (no walking, but a very slow pace overall), sat in the garden and read a magazine while my hair started to dry, watched the football and then walked into town to get my free Vitality Starbucks (and some vitamins). We’re off to the cinema in a bit to see Ocean’s 8 which I am looking forward to- hopefully good fun and nothing too taxing. I hope you had a good weekend? 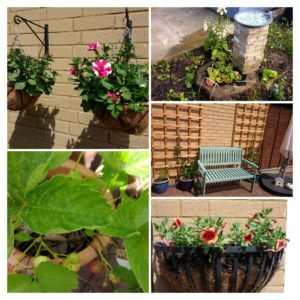 Author Maria RunsPosted on June 24, 2018 June 27, 2018 Categories General ramblings, Running, Stuff I love!Leave a comment on Foo Fighters and then a quieter weekend! For the last couple of weeks we have headed outside towards the end of our yoga sessions. The yoga I go to is from 7.45-9pm (well, more like 9.15) and so it’s only been light enough to do this recently. The little room which we use overlooks a secluded communal garden area, which is gorgeously decorated with fairy lights. After the normal past of the session (warm up, whatever bends/ twists we are working on) we then took our mats into the garden onto the grass. The first time we did this, we practised handstands. Now, I could never do a handstand as a child, but they are sort of launched into (you remember, people would stand up, then all in one move throw their hands on the ground and jump their feet up). For yoga, you begin with your hands on the floor and jump your feet up. We did it in pairs, with the partner standing up ready to steady you by holding your hips. The person I was paired with used to be a gymnast, so she was pretty strong and very steady. However, I was not. Although I did get the furthest I have ever got with it. I think I am partly very nervous about it, but also my shoulders are not very strong, so once I get upside-down my arms collapse. But in the week I have been trying to do some press ups to work on strengthening my arms, and I think it’s been helping. This time I almost managed it- eg I was being held for a split second by my hips before I came down. I was tired by this point as I’d been practising the jumps for a bit, which is draining on the arms. Then last week we again did the warm up inside and then took our mats outside. This time one of the inversions we practised was the headstand. I can’t do the normal headstand at all as I just can’t get my legs close enough to my body to be stable before my legs go up, but I can partially do the tripod headstand. (If you click on that link, I can do the bit where you rest your arms on your knees, but I’ve never got further on my own). Last week I managed to get my right leg straight up, but just could not push my left leg up at all. This was without being steadied, whereas before I’ve only partially managed it with someone holding me. Progress! Then this week was the day before the summer solstice, and we had been told to be prepared to be outside for the whole time. I took a sweater with me although I only needed it for the very beginning and very end. There is something quite earthy and magical about doing yoga outside, under the trees, with the sound of the wind rustling the leaves and birds singing. After some warms ups the main part was sun salutations- last year we did the same thing where we did 3 sets of 9 sun salutations (and a set is one on the right and one on the left). In between we did some other poses to help release shoulders and wrists and by the end I was really feeling it. It’s also a bit hypnotic doing the same move over and over again. Before our final relaxation we did some partner work on shoulders (sitting back to back and linking arms or twisting around) which really helped. The final relaxation was just so peaceful and grounding. I was feeling very zen after! Generally though I’ve been quite tired recently. This time of year is always draining and I think it’s been affecting me more than I realised at first. For the summer term we have had a staff yoga session on a Thursday- it’s been for complete beginners and is a slightly different style to the class I am used to but I’ve enjoyed it so much. As Thursday is also a run day, I’ve been stopping on my way home for a short run after yoga, but I’m not sure if that has been too much. Last Thursday the run after yoga felt like wading through mud, but we did a lot of leg work so that could have been why. At the weekend (after Upton something parkrun on Saturday) I did an 8 mile run on the Sunday and had to walk a few times- not sure why as the route isn’t particularly hilly and I wasn’t going fast. After that I did some gardening, and part of that was planting on seedlings which I did crouched down, and my legs regretted that later! On Monday we had a nice walk in the evening to stretch out my legs but they were still sore. On Tuesday my back and legs were sore (and my wrists, no idea why) but I went out on a run to see if it would ease my aches. I probably shouldn’t have- just under 4 miles took me just under an hour as I walked so much of it. I just felt shattered. It was a lovely day to be out, and I saw so many rabbits, so I ended up taking a lot of photos to distract myself. I decided then that I would not be running after yoga this week, and so hopefully I’ll be feeling better by parkrunday. 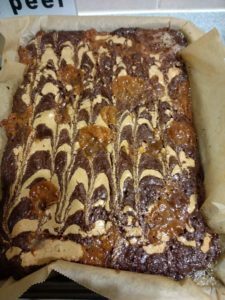 Lovely Pudding Stop peanut butter and salted caramel brownies. The caramel is in the middle but lots of it leaked out during the baking. They are very tasty as they are all gooey in the middle (and of course, peanut butter). I’m excited for the weekend as we are going to see The Foo Fighters tomorrow evening- Andy got me tickets for my birthday. What do you have planned for the weekend? 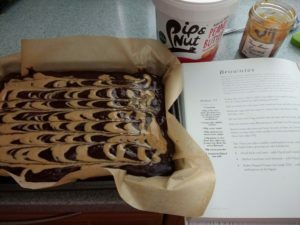 What would be your ideal brownie? I do like ones with raspberry and white chocolate, or anything nutty. Are you happier exercising outside or indoors? I would pretty much always choose a run outside over a treadmill, and there is something so much better about fresh air. One more letter ticked off! By the end of the week I was feeling pretty tired (my phone alarm woke me up on Friday which pretty much never happens- the radio in the other room goes off a few minutes earlier and I usually hear that), but then this is our last weekend for a while where we don’t have much on, so in the back of my mind I’d pencilled in some parkrun tourism. My dad was away and my brother wasn’t well, so it would just be me, so I decided to see how I felt on Saturday morning. I was up bright and early before my weekend alarm, and so decided to head to Upton Court (which I confuse all the time with Upton Park) for the parkrun, to get another letter ticked off. It’s close to Slough, so it means heading around the M25- fairly quiet first thing on a Saturday but a bit of a nightmare once heading home (and I tell myself that driving on the M25 anyway is good for me because I am not a fan of motorway driving but it gets me more used to it). Ah well, the things we do for these challenges. On the walk we chatted about various parkruns that we had both done- he’s done around 30 different ones but hadn’t heard of the alphabet challenge when I mentioned it. I think at first he thought it was a bit strange (maybe it is?) but then he started listing them- it seemed like he had a fair few letters. Anyway, the parking was only around 1km from the start and once we had gone through the gates from the car park I could see lots of runners heading in the same general direction, and then the finish funnel etc. Just as I got there, they called out for the new runners briefing. Again, I had not even read the course description! I turned out to be a two lapped course, with the first lap containing a little extra bit (by the conker tree I think the guy said). They asked where we were from and the guy next to me said “Ellenbrook Fields” so I replied “me too”- what a coincidence. When he asked me why I was here and I said “getting my U” he said “me too”- at least he understood my madness! He had around 5 letters left- very impressive. The main run briefing then took place and it was very hard to hear as big planes kept flying over (it’s near to Heathrow) but I could just about make out the volunteer thanks and a milestone mention. They asked to find the tourist who had come the furthest- the lady from Cape Town won that one hands down! Then we were off. The start was up a gentle hill (basically the field was on a small slope)- it wasn’t much but suddenly the sun came out and I was boiling. It seemed there were lots of fast runners there too as it felt fast for me (I didn’t look at my watch while I was running, but when I looked on Strava after I had an impressive positive split of 8:46, 8:48 and 9:05- whoops) and I struggled with my breathing for some reason. Anyway, the route was really enjoyable. They had permanent km markers on the way around, a few marshals out on the course, and the route was varied enough. 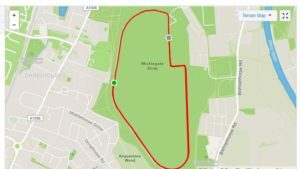 It went around a field, across the top (near to where I had parked) then around a wooded area to make the first lap longer. There were lots of lines of trees to run past, so you couldn’t see the rest of the course. At around 3km I passed through the finish area before starting my second lap, and I think they were just getting ready for the first runner to come in- incredible as I think it was around 15 mins)- I like this element of lapped courses as you get a little mid-run cheer from the token people. The second lap seemed to fly by (although I was finding it tough and all I could think about was my t-shirt and how hot my arms were). I finished with position 85, with 27:35, so a fairly speedy time. If only I had paced myself better I am sure I could have been faster- it seems like a fairly fast course. The scanning took place in the little rugby clubhouse- I saw a few people with bacon rolls and things, but annoyingly I’d left my purse in the car so couldn’t buy a cup of tea or anything. It seemed like you could leave bags etc inside too which would be handy in the winter if you wanted to leave a jumper or something. I made use of the toilets (including washing my face because I had also forgotten face wipes) before walking back to the car as a cool down. I’d brought some water and a blueberry nakd bar with me so I had something to eat before tackling the drive home (where I managed to get a bit lost by thinking I knew better than the satnav…). I really enjoyed this course- I think in the winter it would be tough as most of it was on grass so it would get very boggy, but it was a really friendly event. Now the letters left for me: D, I, J, K, Q, V (and I suppose Z if I count international ones). I have loose plans for Queen Elizabeth Country parkrun (I did try to do that before but ended up at Portsmouth Lakeside), and possibly Victoria Docks when we are in London in July, but I am not sure about the other letters. Any suggestions? Do you mind driving to new places? I’m much better with a satnav now, but I still prefer to be able to picture most of the route before I leave as otherwise I can get a bit flustered if I get lost. 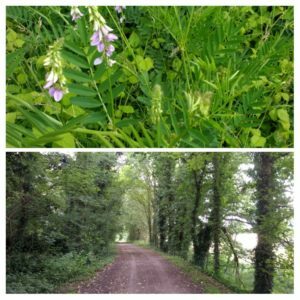 Author Maria RunsPosted on June 16, 2018 June 17, 2018 Categories General ramblings, Running6 Comments on Upton Court parkrun! A catch up and happy birthday NHS! How is the weekend over already? 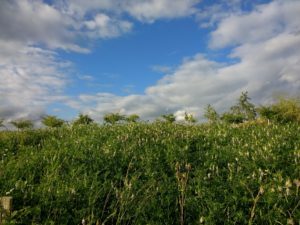 Last weekend was full of unpacking, weeding, a little visit to the garden centre and a 10 mile run (my first in double figures for a while). 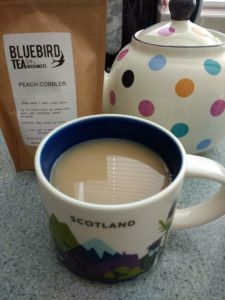 This peach cobbler tea is delicious (in my new mug). 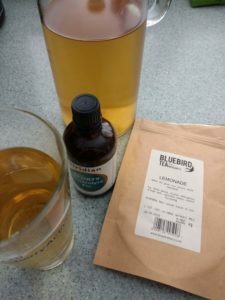 I’ve been having success with the viridian sports mix- I have been adding it to either coconut water or iced tea (this was lemonade iced tea) and so far I’ve not had a headache when using it. 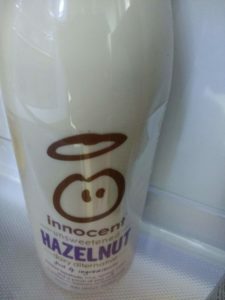 I saw this Hazelnut milk in the shops and could not resist- it is pretty amazing and although it’s been way too warm for it this week, would make a delicious hot chocolate. Wednesday- yoga including a bit of time outside on the grass attempting handstands- it was the closest I have got and my shoulders were really achy the next day from it. 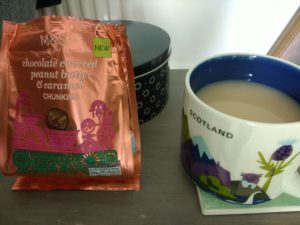 Friday- home to find that Andy had bought these little peanut butter caramel things from M&S- so a couple plus a cup of tea made the perfect start to the weekend. We had a nice walk after dinner once it wasn’t quite as warm. 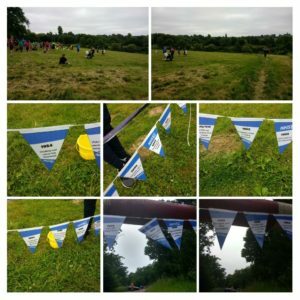 Saturday was parkrun celebrating 70 years of the NHS. 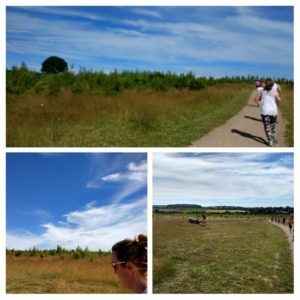 I was going to go to Panshanger as I’ve not been there for a while, and then early on Saturday morning I got a message saying we’d be out on Sunday morning, so I decided to run there and back on Saturday (parkrun sandwich) to get my long run in then. The run there is just over 4 miles, and I always panic about missing the start, although I got there at about 8.50 so good timing really. There was bunting up all over the car park entrance, by the finish funnel and where the scanners stand. It was brilliant to read so many of the amazing achievements- vaccines/ transplants/ screenings (although how was it that in 1954 the link between smoking and cancer was discovered, and smoking wasn’t banned in public places until 2007???). Before the start they asked everyone who worked for the NHS to come up so we could give them a clap, and a local nurse (who I think they said was an MBE) did a little speech. A few people had paper on their backs saying things like “thank you NHS for saving my life” and listing various illnesses. 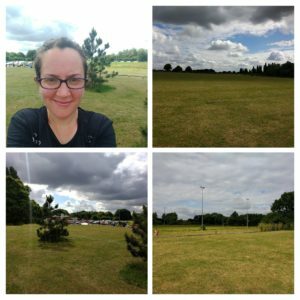 It was brilliant to hear that some GP’s in Hertfordshire are exploring prescribing parkrun to people- I really think that being involved in a community like this is way better for your mental health than your physical health, and just getting people outside for some fresh air is so beneficial. Then we were off. I was in no hurry, knowing I had to run the 4 miles home, and just really enjoyed the scenery. I saw someone from my running club but she was ahead of me and I didn’t catch her up. I finished with 30:30, and made sure that as soon as I was scanned I started running home so I would not get too stiff. I saw this pretty plant on the way back- lovely red leaves and layers of pink flowers- I need to work out how to search google for it. 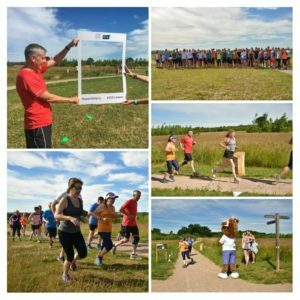 Did your parkrun celebrate the NHS? 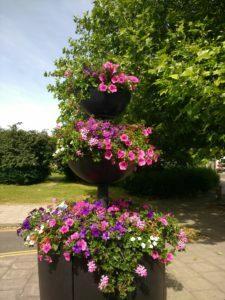 Author Maria RunsPosted on June 12, 2018 Categories General ramblings, Running8 Comments on A catch up and happy birthday NHS! I was rather happy that we stayed in York for the final night of our trip to Scotland, because this meant not only more parkrun tourism, but ticking off a rather tricky letter. I think the only other one is Yeovil? After leaving Newcastle, we drove down to York, stopping off at a NT place for a walk around the gardens. As a side point we found it good to break up the journeys with stops this time, as our default setting is to power through and then feel all stiff when we finally get out of the car. We managed good amounts of steps each day, with a high of 27,000 steps on the Thursday and a low of 13,000 on the first Saturday. 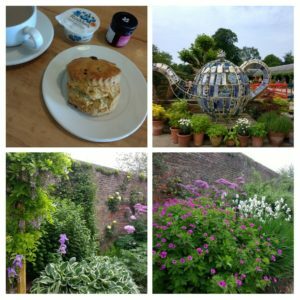 I was very pleased to see amazing looking scones, so I treated myself to a cream tea as a sort of late lunch- it was so good. Once in York we had a wander around- it was jam packed with people, and such a hot and sunny day. We went for dinner in Source, which had loads of veggie and vegan options, I was spoilt for choice. We shared a lime-grilled avocado to begin with. I’ve not had warm avocado before (I don’t think) but it was really tasty. It was served with a little bit of crusty bread, so it was a bit like warm guacamole or something. Very creamy and delicious. 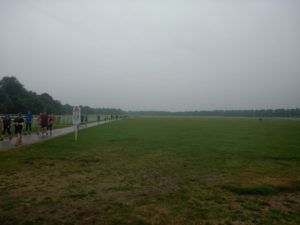 On a rather damp and drizzly morning, I set off to the parkrun on the Saturday morning. It was around 1.7 miles from the hotel, so good distance for a warm up. I’d much rather run than have to navigate bus timetables and that sort of thing, and although I needed my phone out at first (the roads in York are a bit twisty) once I was on the main road heading out of the town, it was all fine. 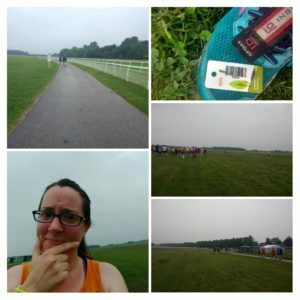 York parkrun is held on the racecourse, so there were signs once I got close which helped too. The website does say to allow time to get from the road to the start, and it ended up being a kilometre, so you do need to be aware of this. 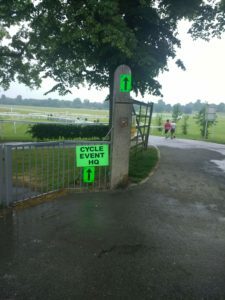 Confusingly there were signs for a cycle event (cue a slight bit of panic in case all the lycra people were cyclists) but then I saw a couple of milestone t’s so I knew I was OK.
By then it had started to rain a bit harder, and there is really no shelter here at all either. Everyone was trekking along the edge of the track to the start, and of course as soon as I stopped running my glasses steamed up more. The new runners briefing was very welcoming, and they had a few pacers including a run/walk pacer who came and introduced herself in case anyone wanted to go with her. Now, I had read it was pretty much pancake flat, so thought it might be good for a pb, or at least a fast time, but I wasn’t feeling it, so in the end I decided to aim for the 28 min pacer. The route starts at one side of the race track, you do a full lap (3 k approx) and then a final 2/3 of a loop (around 2km) to the finish. I must admit that if I ran here each week I would find it mentally very tough. It started off feeling a bit interesting to be running next to the race track – we were inside the fence on a path, with the track going around the outside (although my thoughts wandered over to the morbid side of horse racing, wondering how many poor horses had been shot on the course), but you could see the whole route the entire time. It was amazing how quickly the front runners steamed ahead of everyone else, and although I managed to get to the finish on my first lap without being lapped I don’t think I’d need to be much slower to be overtaken (this doesn’t bother me but just makes it more congested and surely more confusing for the volunteers). The scenery around the outside changed a little bit- there was a lovely wooded area to one side and you passed the grandstand near the finish area. But it was pretty much the same view all the time. I am not a huge fan of long straight roads as I just feel like I am not moving. The finish at Ellenbrook Fields is along the old taxiway and it’s a km from start to finish, and that can feel like a slog. I must admit when I got to the 3km point I wasn’t enthused about running 2 more with the same views. I do think it would be tough on a sunny day too, as there was little shade on the course. There were however some lovely cheerful marshals out on the course, and a few runners milling around the finish area cheering people in. The pacers did a great job too- I started further back and so took a while to catch up the 29 min pacer, only getting the 28 min pacer in sight near the end. 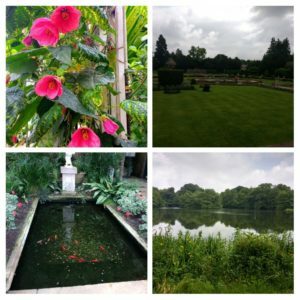 Then it was time to head back- the rain that had eased off during the parkrun was back so by the time I got back to the hotel I was totally drenched- the hot shower afterwards felt so good (or could I have saved time by just putting the shampoo on my hair while I was running?). 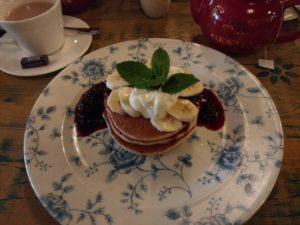 We headed to The Cosy Club for breakfast- lovely pancakes with bananas, berries and creme fraiche, plus a pot of tea, and then it was time to drive home- in keeping with tradition we of course stopped off at a final NT place for a walk around some woods and gardens. 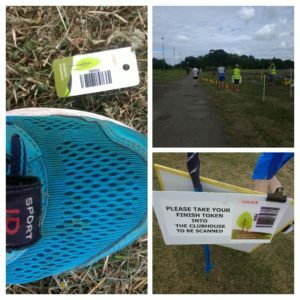 Are you a fan of parkrun tourism? Are you hunting any particular letters or doing other challenges? I quite like the pirates challenge (7 c’s and one r) but I’ve done all the local C’s already. I enjoyed my Herts challenge too (running all the parkruns in Hertfordshire) so I feel like maybe a new county would be good to consider. I still mainly aim to be a tourist if I happen to be away somewhere, although the closer I get to finishing the alphabet, the more likely I am to become more serious about it!